Sri Lanka beautifully blends beach with heritage, wildlife and spirituality, as these Sri Lanka photos show. Find out about some of Sri Lanka's top attractions in this gallery, or read more about the top things to do in Sri Lanka. Pinnawala is an elephant orphanage, located halfway between Colombo and Kandy, northwest of Kegalla in the hills of central Sri Lanka. The sanctuary was established in 1975 by the Sri Lanka Wildlife Department. It's home to around 75 elephants. The highlight is when they take a bath in the river. The entrance fee, of about $15, helps fund the upkeep of the elephants. Opinions of the sanctuary are mixed though, as elephants are chained and ridden. Fascinating Sigiriya is listed as a UNESCO World Heritage site. Situated in the central Matale District of Sri Lanka, it's comprised of the ruins of the capital constructed by King Kassapa I (477–95). Surrounding the rock are the remains of an extensive network of gardens, reservoirs, and other structures. The final ascent to the summit is through Lion Gate, where a gigantic brick lion once sat at the end of the rock. Today, only the paws remain. Sigiriya is also known for its colorful frescoes, painted onto the rock face around halfway to the top. On top of the rock, Kasyapa is believed to have built a pleasure palace and fortress. Expect to pay a costly $30 entry fee, per person. Most people say it's worth it though! Nissanka Malla's Palace forms part of the ancient city of Polonnaruwa. Only the foundation and few pillars remain of this building. Polonnaruwa, a UNESCO World Heritage site, was the second capital of Sri Lanka after the destruction of Anuradhapura in 993. The ruins comprise a range of monuments built by the ruling Cholas, and the grand gardens created by Parakramabahu I in the 12th century. The entrance fee to Polonnaruwa is $25 per person. A highlight at Polonnaruwa is a group of Buddhas carved from a solid granite outcrop. One of them is a 14 meter long reclining monolithic Buddha statue from the 12th century. Nuwara Eliya is the highest town in Sri Lanka, making it a refreshing place to visit. It's the home of Sri Lanka's famous Ceylon Tea. Negombo, situated close to Sri Lanka's international airport, is a popular first destination for visitors. It's a fishing village with and old world feel, and is renowned for it's delicious seafood (buy it fresh from the local fish market) and health retreats. Commercial fishing isn't only done by boat in Sri Lanka. Fishermen also use stilts! This astonishing spectacle dates back to the 1940s, when it started as a way to overcome boat shortage during World War II, and was made famous when captured by renowned photographer Steve McCurry in 1995. However, these days, most of the fishermen have discovered that they can earn more money posing for tourists. Most of them are located in places such as Koggala and Weligama, on the coast south of Galle. You'll need to search around to find the real ones and perhaps seek local guidance. Try it yourself -- it's not as easy as it looks! Unawatuna beach, near Galle on the south coast, is one of Sri Lanka's most lively beaches. This attractively developed, horseshoe-shaped beach has a great mix of resorts, hotels, restaurants and small shops. There are water sports too, making it an appealing family destination. Mirissa beach, the next major beach destination south of Unawatuna, is ideal for anyone wanting a more intimate and peaceful beach getaway. Whales are often sighted there. For pristine, untouched beaches, head to Trincomalee on the northeastern coast of Sri Lanka. Uppuveli beach has fine white sand, clear water, and less undercurrent. Bring a good book because there's really not much to do there apart from swim and relax! The remarkable Gangaramaya Temple, located near Beira Lake in Colombo, is both a Buddhist temple complex and center for learning. It's involved in welfare work including old peoples' homes, a vocational school, and an orphanage. The city of Dambulla, located to the north east of Colombo, is home to the UNESCO World Heritage listed Dambulla cave temple (also known as the Golden Temple of Dambulla). It's the largest and best preserved cave temple complex in Sri Lanka. The temple's major attractions are spread over five caves, carved into rock, each containing statues and paintings related to Lord Buddha and his life. It's quite spectacular, and well worth the $10 entry fee. 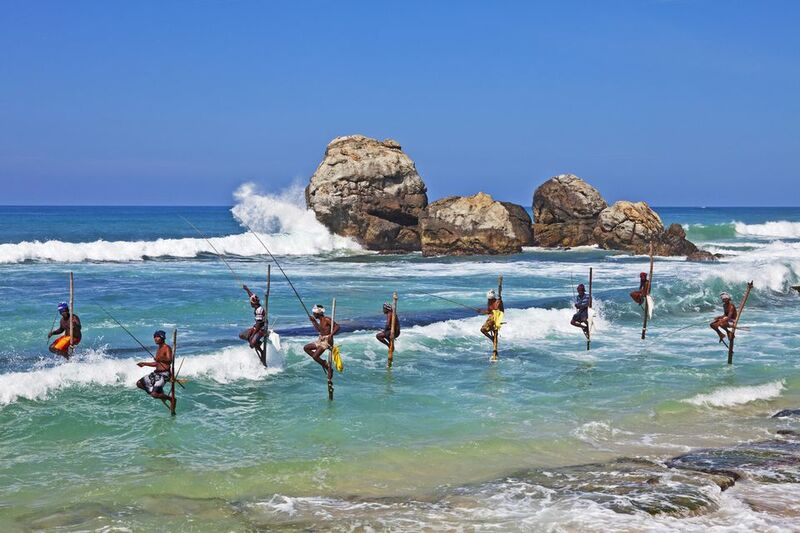 The resort town of Bentota, between Colombo and Galle, is best known for its water sports. However, the Maduganga wetlands mangrove jungle is an off-beat attraction there. It's possible to explore them by boat. You'll be able to spot many birds (and perhaps a few crocodiles and monitor lizards) as well.